With the introduction of an iPad cart to The Frisch School at the beginning of the school year and the distribution of iPads to the entire freshman class last month, using apps will soon be second nature to any Frisch teacher. I've had an iPad since September of 2011, but since my students did not, I couldn't really exploit it as a teaching tool. This year, obviously, that has changed. After attending technology boot camp this past summer with the school's amazing Director of Educational Technology, Rabbi Tzvi Pittinsky, I decided to make my way slowly through the plethora of apps available to educators. One which I focused on is ShowMe. I started the year using it in my sophomore grade and had students create ShowMe presentations about their summer reading assignment, the Gothic novel. Students worked in groups and over the course of a few days, but I realized doing so was not a good way to use the app. 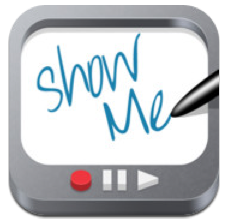 A ShowMe presentation really needs to be made in one sitting, and I also didn't love the app for group work. I think its features work best for a single user. When the sophomores were well into their project-based learning venture of the year, an interdisciplinary unit exploring Africa through a myriad of lenses, I remembered the ShowMe app when the students and I decided to make an audio tour of an analog savannah and jungle the grade was creating on the school's stage. The app seemed perfect for an auditory venture. First, a couple of students and I wrote a script for the presentation, one which was based on research many students in the grade did on the African veld and rainforest. The script called for animal sounds to be heard at certain junctures, so we purchased elephant, lion and general jungle sounds from iTunes. We also needed sounds of the "Frisch jungle," students joking around and talking to each other. We recorded those sounds on an iPhone, to use in the ShowMe. Since we also wanted the script to be read in Hebrew, the students approached one of the Hebrew Language teachers and had her write a condensed version of what we wanted to say. We had actually wanted French and Spanish versions of the audio as well, so all the languages the school teaches would be represented in the tours (OK, full disclosure: we confess we didn't plan on anyone reciting anything in Aramaic, the language in which the students learn Talmud.) However, the Africa unit was taking so much effort to put together, we couldn't spare the time to make so many different versions of the script. If we do the multi-disciplinary project again, we'll start writing the presentation earlier in the process. Going forward, I plan to use ShowMe in the way I used it for The Frisch Africa Encounter. However, I want each of my students to write a script and then recite it, once I've proofread and edited their work with them. I think the app can be a wonderful tool that not only enables students to do some scriptwriting, but also to think about an audience they want to reach with their words. Developing an appropriate voice is always a challenge for students, but having to recite their work will give them a chance to think about who they are addressing and what kind of tone and language would be most appropriate for their work. I also think, in an English classroom, students should become proficient in articulation and verbal presentation of ideas; ShowMe would certainly develop those skills. Script writing would also be appropriate in a history class, after an exploration of one or more famous speeches. Students can then be given a chance to write their own Patrick Henry speech or Gettysburg Address. And foreign language as well can make use of the app in the ways I've described. In fact, if your school is focused on interdisciplinary collaboration, students could write a speech in English or history and then work with their foreign language teachers to translate it into the language they're studying. And who knows? Maybe next year, I'll be writing about an audio tour students wrote in Aramaic! For more information about the Africa project, see The Frisch Africa Encounter blog post. Thanks for sharing this highly original application of the ShowMe app. Maybe next year, in addition to the Audio tour Showme can be used to add a visual component as well. The app is designed to work with pictures and well as sound and the user can manipulate these visuals by drawing, writing, and highlighting as well. Perhaps students can photograph in advance different parts of the tour they wish to highlight and then as they explain these parts in the audio they can show the pictures as well to enhance the experience the participant is seeing much like a museum tour where one can get an inside look at the artwork through the audio visual tour.